Born in Donegal in 1891, Patsy Gallacher is regarded as one the most gifted footballer to ever wear Celtic Jersey. 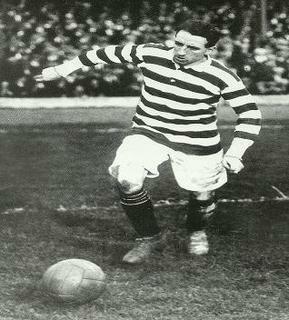 Nicknamed "The Mighty Atom",he was signed by Willie Maley in Oct 1911 and made his debut in a 3-1 win over St. Mirren. Despite his slightly frame Pasty Gallacher, made of stem stuff and refused be build by bigger opponents. His footballing abilites were a revelation and he would terrorise opposing defender with his cheeky skills, mazy run and a powerfull shot. Gallacher who come to Scotland as a young child to escape deperate poverty, was a key factor in hugely succesfull Celtic side and played with the Hoops for 15 years winning the league six times and the scottish cup four times. He played a total of 464 for Celtic scoring 192 goals. He was capped at international level by both Eire and Northern Ireland. After a fall out with Maley in 1926 Patsy Gallacher signed to Falkirk with whom he finished his career. Gallacher died in 1953. For such a puny frame his stamina was phenomenal, and at the close of play he was worrying the opposition with the same degree of doggedness that had marked the opening minute. Maybe worth a STA increase?